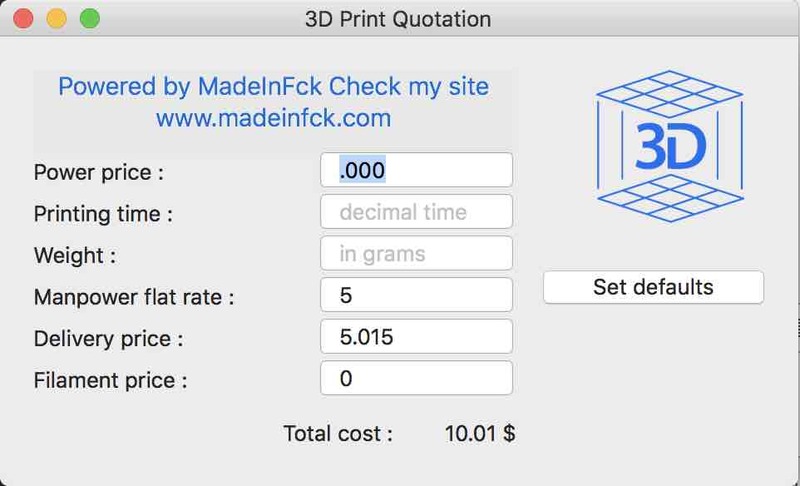 After releasing v1.2 of Print3DQuote on the Mac App Store, iOS version has been finally released as well.The aim : be autonomous to evaluate one’s 3D printings and share a quotation with one’s customer. As I was well aware that capacities offered by this app were not enough accurate, I kept on coding to propose some new features. You’ll find them at the end of this article as an update. 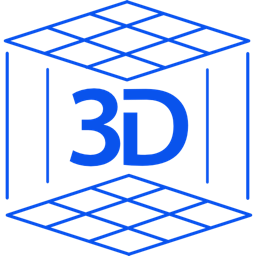 Indeed, I registered with 2 web platforms which offer the opportunity to get in touch with potential customers interested in 3D models but lacking a 3D printer. The first one is well known one : 3D Hubs. The other one is Freelabster, working only in France. They both offer an estimation tool of models but as they charge for a fee, the best way to know precisely the price was to create my own application where one can set his own parameters. Of course, you can modify all the above parameters. However, instead of always changing the price for electricity, manpower rating, delivery and the price of your filament, you can decide to set as defaults. Each time you’ll open the app again, you’ll found those ones recorded and ready. Initially only designed in French, the app has been internationalized to make it usable for french and english speakers. This app can be bought in all stores and the language’s choice will be done automatically according to your device’s settings. Morevover, preferences window is now implemented. Choice for currency or filament price criteria now allow to manage and get a quotation accordingly to your preferences. Help part is also now available just in case of one needing it. Quite simple but might help at anytime. Visualization of the quotation as a document in a new window. Printing capacity of this quotation. Ability to share the quotation document via mail. Now available also for iOS devices. Enhance UX and design by adding animations. Ability to share the quotation document via social networks. Please leave comments and suggestions on this site or on my Twitter. Need a quotation for your model before 3D printing? [Updated with iOS version for iPhone and iPad] par MadeInFck est sous Licence Creative Commons Internationale Attribution-Pas d'utilisation Commerciale-Partage à l'identique 4.0 .